In the past, if you were a Stephenville resident craving Thai or sushi, you’d have to drive to Granbury or Weatherford to satisfy your hunger. 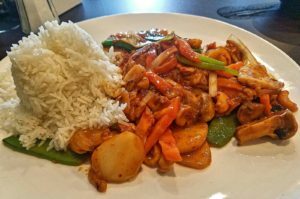 It wasn’t until the spring of 2017 that you could enjoy a nice Thai dish without having to travel outside of Stephenville. Located at 2121 W. Washington St., Bangkok Thai has officially opened their doors for business. Chicken cashew delight. Photo by Megan Ables. Though the restaurant is sparsely decorated, its food is remarkable. Their wide variety menu offers selections from fish and steak, to duck and curry. Each plate is served with either a cup of onion soup or a house salad. They might as well not serve anything with the meal though, considering the salad is miniscule and the soup is 95 percent broth. Customers have the option of choosing from eleven different appetizers, ranging from $4 to $8.50. I advise that you avoid number eight on their list, which is gyoza. The dumpling looks nicely packaged with its soft doughy exterior and pan seared crisp, but is completely lacking flavor unless it is dipped into the provided sauce. Bangkok Thai offers four different types of curry: red, yellow, panang, and massaman. Each curry is simmered in coconut milk, adding a sweet flavor to help combat the sharp spice that ranges from levels one to five. The customer is given the option of choosing chicken, beef, shrimp, seafood, pork, or mixed vegetables to be added to their curry. Their massaman curry is blended in chili paste and crowded with potatoes, carrot slices, tamarind, onions, and peanuts. Every spoonful is guaranteed to be filled with something different than the last. Served with a side of steamed rice, each curry is stuffed with the perfect combination of ingredients. Crispy pad Thai. Photo by Megan Ables. Much like their curry, their chicken cashew delight is brimming with ingredients. Snow peas, onions, carrot slivers, water chestnuts, roasted cashews, and mushrooms are mixed together and coated in brown sauce to provide added flavor and succulence to the tender pieces of chicken. Don’t be afraid to drag a mushroom onto your fork, as their taste is nearly undetectable. The dish that stood out to me in flavor and excellence is their Bangkok crispy pad Thai. 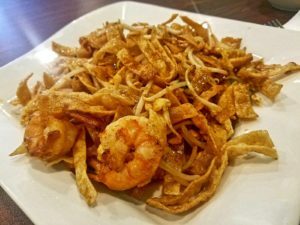 Fried wonton noodles are mixed with broiled shrimp, egg tidbits, bean sprouts, green onions, and crushed peanuts to provide the perfect candy bowl mixture. The crunch of the wonton noodles is slightly lost due the sauce, but it is still potent. Though the shrimp needs more seasoning, this sizable dish is rich with vibrant flavor and a scrumptious array of textures. The restaurant will soon offer their full menu, so stay tuned for their sushi selections and fried ice cream.